Experience a whole new view of the autumn leaves at night. 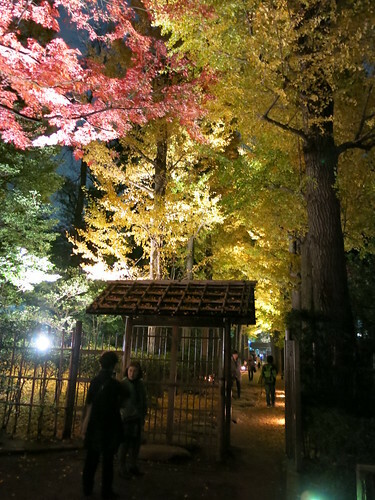 Autumn-leaf viewing is a popular autumn activity in Japan but not everyone knows that it can be enjoyed even at night. Some parks and gardens illuminate the trees after dark and temporarily extend their opening hours for viewing. With the light-ups, tinted leaves glow in shades that are different from when they are under the sun. It’s pretty magical. Here are the three gardens in Tokyo that we highly recommend as the spots to see the autumn leaf light-ups. Wear some warm clothes and enjoy the autumn night! A historical Japanese garden from Edo period (1603-1868). It is known as one of the best spots for autumn-leaf viewing in Tokyo. From mid November until the beginning of December, the park is open until 9pm for lightup viewing. There are tea houses inside the park where you can take a rest and enjoy tea and Japanese confectionery. They also do a free English guided tour on the 1st and 3rd Sunday every month from 11am and 2pm. Located in a quiet residential district in Ogikubo, this beautiful and quiet garden was originally the estate of a music composer and critic, Motoo Otaguro. A ginko tree promenade from the gade leades to a Japanese garden with a large pond and a small tea house. The reflections of the illuminated trees on the pond and streams are amazing. Taking photos is allowed but the use of tripod is prohibited in the park. 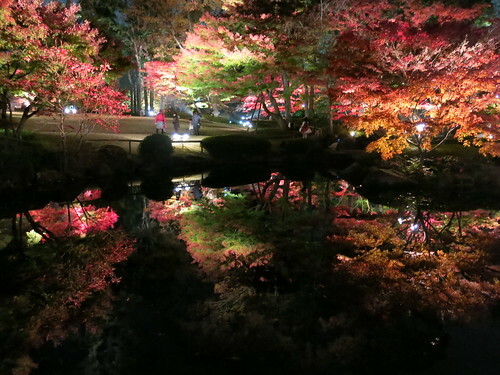 The garden of a five-star Hotel, Hotel Chinzanso Tokyo, is beautifully lit during the autumn leaves season. The garden is open until 11:30 pm and is less crowded later in the evening.